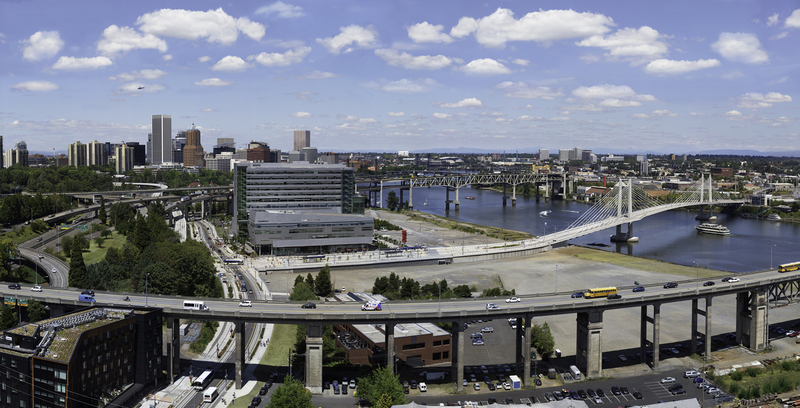 I recently did a very large project: a 20 foot long by 10 foot high single image of downtown Portland, Oregon, as seen from the top of a tall building in the South Waterfront. This post goes into quite a bit of detail about how I accomplished this and the challenges along the way. In general I’ve separated the techniques from the challenges, to give you the option to skim the narrative more efficiently if you’d like. I received an email from JE Dunn Construction, a client I’d done architectural photography for before. They wanted to enlarge one of the high-res TIF images I’d provided them electronically to be 20’ x 10’ to cover a their new video conference room wall, and asked if I could send them a larger TIF file than the one I’d already provided. ORIGINAL REQUEST: The originally requested image; not available at high enough resolution for a 20′ x 10′ installation. THE WALL: The video conference room wall where the image was to reside. It would be the backdrop to all video conferences from this room. Additionally, any image on this wall would be seen from up-close by those in the room walking in and out of the room (door is on the left). Modern DSLRs are pretty amazing [check out Canon’s new 50.6MP 5DS], but there aren’t any still photography cameras out there, digital or film, that could take an image large enough for what they wanted to do. But I wanted to do this project. Badly. Because how awesome would it be to provide an image that could fill an entire conference room wall and still look great? It would be a fantastic blend of photography and architecture (I’m also an architect). Plus, in collaboration with JE Dunn I had managed the design team that worked on the building featured prominently in the image, and I wanted to help JE Dunn achieve their idea. So I gave the challenge some thought. And decided that the way to make an image big enough would be to stitch dozens of zoomed in high resolution images together. I could replicate the original image by reshooting it under similar circumstances, this time shooting it as tiled zoomed in shots instead of one overall shot. In order to verify that this could be done, I grabbed my camera and headed out to take some test shots. I used Lightroom to post-process them, then exported them into Photoshop for the stitching. It worked well (if slowly – it requires a lot of RAM and scratch disk space!). I took the resulting test image and created an electronic mock-up of what the room would look like. You’ll see gaps in the tiling of the images, and the image itself isn’t great, but I learned it could be done. I ran my solution past JE Dunn, got the go ahead, and launched into the project. ROUGH TEST: I quickly shot test images to see if Photoshop would correctly stitch them. I used the resulting image to digitally mock up what the project would look like in the conference room for the client. This effort highlighted a composition issue related to the location of a light switch, control panel and fire alarm strobe on the wall, and allowed me to better compose the final image. I shot the image with my Canon EF 70-200mm f/2.8L IS II USM lens on a mostly-sunny day. I picked this weather because I wanted the city skyline in sun (like the originally requested image) as well as some puffy white clouds in the sky. I took my tripod, thinking it would be easier to tile with it. I was wrong. Because I was going both side-to-side and up-and-down, the tripod only slowed me down, and it’s important to work quickly. I ended up using my tripod as a monopod to help keep the lens steady while I manually tiled the image. Manual Mode: It’s important to not have the camera changing exposure settings from tile to tile. ISO 200: Keeping the noise down. f/16: Deep depth of field, but trying to avoid soft image edges sometimes associated with extreme ends of aperture range. 1/200 sec: Fast enough with image stabilization and a monopod to get crisp images. Auto Focus: Even with everything far away, there is a range in infinity, so let the camera do the work. 200mm: Maximum telephoto for this lens to maximize final image resolution. I shot in a pattern, working quickly, and making sure each image overlapped the prior image by 1/4 to 1/3. I was careful to not leave any gaps. If an area had a shadow over it, I came back and shot it again when the shadow passed. I shot significantly beyond what I believed my final image borders would be. I wanted to be sure I captured all of the image I would need, and give myself some extra wiggle room in case I needed it. My afternoon shoot captured over 350 images. Some for the main stitching effort, and some for later compositing of interest elements. A TILE: This shows a single image “tile”, as originally shot. Clouds: Those puffy white clouds proved to be the biggest challenge to the shoot and post-processing, for two reasons: 1) clouds cast shadows on the ground, and 2) clouds don’t hold still. I shot the entire scene twice, mainly because of the clouds. My first shoot was at mid-morning, and while the sky was gorgeously blue with perfect white clouds scattered throughout it, those same clouds were casting too many mottled moving shadows on my cityscape. I shot the whole scene, but then came back in the afternoon when more of the clouds had burned off, and shot the whole thing again. Because clouds are both constantly in motion, and constantly evolving I found it hard to keep track of where I was in the sky as I was tiling the shots, and I needed to work as quickly as possible so the clouds that were in multiple tiles didn’t have time to morph much. Interest: I knew this image would be huge in the end, and the viewer would be able to see a lot of detail. I didn’t want the middle-ground and foreground of the image, which was largely filled with roadways and river and empty lots, to be boring. So I stuck around for an extra 45-minutes or so after completing the main body of tiling and continued to capture tiles that had things of interest in them. For example: school bus, people on bikes, transit bus, streetcar, light rail train (they were testing the new route that day), various kinds of boats on the water, a helicopter, etc. I later composited many of these elements into the image to give it more interest. My workflow is such that all of my images are imported into Lightroom and catalogued. I also batch processed lens distortion corrections with Lightroom. Once I identified all the tiled images I wanted for the main body of the image, I exported them all at once (167 images) from Lightroom into Photoshop using Lightoom’s Edit In > Merge to Panorama in Photoshop function. Photoshop did an amazing job. It crunched data for three hours before presented the results. Needless to say, I did other things while I was waiting . . . played Monopoly, read War and Peace, etc. Once completed, I had a ragged-edged main image and some additional cloud images that Photoshop couldn’t successfully puzzle together floating around the edges. I saved the file, which took an additional hour. The file was a whopping 34.6 Gigabytes. RAW STITCH: The 34.6GB stitched image, pre-cropping, after I roughly placed the loose cloud elements in the sky. In the interest of getting the file size reduced as quickly as possible, I cropped the image to something just larger than its final cropped size and did a save-as. I then spent about 8 hours combing the image for incorrect tile seams, vehicles chopped in half and other graphical issues, fixing them as I went. I would merge adjacent overlapping tile layers once they looked good, again to reduce file size. I saved every 2-3 hours in the beginning, with the frequency increasing as the file size became smaller and the resulting wait time to save becoming shorter. Once I had all the layers merged and the file saved, I went back to Lightroom and looked through the compositing tiles I had made of things of interest. I then composited them into the image in their correct locations, again merging layers as I went. Once the image was complete I did final post-processing for shadows, highlights, contrast, color correction, etc. FINAL IMAGE: The final image (only much smaller than actual!). FINAL MOCK UP: The digital mock up of the final image. File Size: As mentioned above, the file size was a challenge to work with. I probably should have had more scratch disk space available. The max size of a TIF file is 4 Gigabytes, so my final image to the client (at just over 4 GB) was provided in .PSB format (Photoshop large document format). Resolution: I had to actually take care to not have too much clarity in some areas of the image. When zoomed out it never occurred to me that we could recognize faces or make out license plate numbers on the final installed image. But in zooming in 1-to-1, it became clear I needed to be careful with the final image to maintain privacy. Moving Elements: Vehicles and other moving elements have a tendency to either 1) get chopped in half at the edge of a tile, or 2) be repeated across multiple tiles if they are moving in the same direction my tiling pattern moves. Clouds: Ah, those puffy white clouds! Not only could Photoshop not stitch them all together in the sky, I was challenged to do so, too. They change and evolve. And then the final pattern in the sky isn’t balanced. I spent a lot of time getting the clouds to look right. Compositing Boats: Boats moving on the water make wakes. And wakes spread. When I shot for boat composite tiles I needed to make sure I captured not just the boat, but the long trail of wake as well. In post processing I needed to not just include the wake, but alter the spread of the wake so it aligned from tile to tile. The final file was provided to my client, and they gave it to the printer to transfer to wallpaper and install. The printing and installation was done by Matt Fishler of MotoGFX. The installation job was excellent. The wallpaper was done in four foot strips with a ½ inch overlap. The seams were lined up perfectly. In the end, I did the project in a single week to allow time for the printing and installation. It was worth the effort. The image was a hit at the Open House for JE Dunn’s new offices, is remarked upon by viewers on the other end of video-conferences, and I was able to accomplish something that I found to be both challenging and exciting. I’ll update this post with better images of the final installation once they are available.